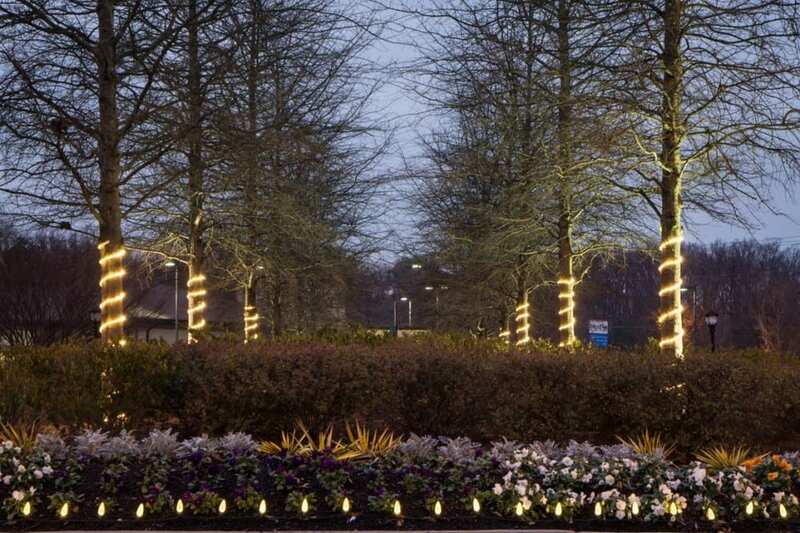 There are many considerations to make when installing commercial landscape lighting in Atlanta. Businesses are competitive, so lighting should be optimized to achieve the desired effect. Because landscape lighting can have such a significant impact on the overall appearance of a business, it’s essential to use a landscape lighting company with experience. With over 5,000 jobs installed, NightVision Outdoor Lighting can handle are your commercial landscape lighting needs. Careful planning prior to commercial landscape lighting installation is the key to successful lighting design. An outdoor lighting professional from NightVision Outdoor Lighting will sit down with you to learn precisely what your needs are. We’ll ask you to consider what you would like the primary focus of the lighting to be, and what styling options the business you prefer. For instance, some businesses prefer to emphasize the architecture of a building, while others prefer to focus on signage, perhaps highlighting a logo or a brand name. Still, other businesses prefer a more natural look, placing the focus on trees or gardens. Well-placed commercial landscape lighting draws attention to a business and can have many benefits. Commercial landscape lighting should provide aesthetic appeal, bringing out the best in your business. It should also be energy and cost efficient. Commercial landscape lighting should also ensure safety and security where necessary. A good design incorporates all of these necessities into an outdoor lighting system that is ideal for your business. Business owners can transform their businesses into memorable showplaces with the right combination of landscape lighting options. Strategically placed, high-performance light fixtures can highlight and illuminate specific areas of your business and draw attention away from undesirable aspects of your building or grounds. They can also improve the safety of walkways and other high-traffic areas of your business. When doing business after dark, a well-lit parking lot or garage can make a huge difference in a customer’s overall sense of security. A beautifully illuminated walkway can effectively lead customers toward an entryway better than any signage. Good lighting increases your business’ visibility and creates an immediate positive impression. For retail locations, well-designed commercial landscape lighting can help increase foot traffic drive up sales. Georgia businesses that are considering landscape lighting should consult with a qualified professional landscape lighting service. NightVision is a local Atlanta lighting company with the experience and expertise to design the perfect lighting solutions for any business. Since 1997, NightVision has gained an excellent reputation for providing expert commercial landscape lighting options and outstanding customer service, resulting in their being awarded the Customer’s Choice award for 3 straight years. No two commercial landscape lighting projects are precisely the same, because no two businesses have exactly the same needs. That’s why it’s important to call in expert lighting designers to assess each situation and to come up with the best and most practical lighting design plan to suit the individual business. It is important to use durable, technologically sound lighting products for every Atlanta or North Georgia commercial lighting project. NightVision is a well-respected resource for these types of fixtures, at prices that even businesses on a budget can afford. 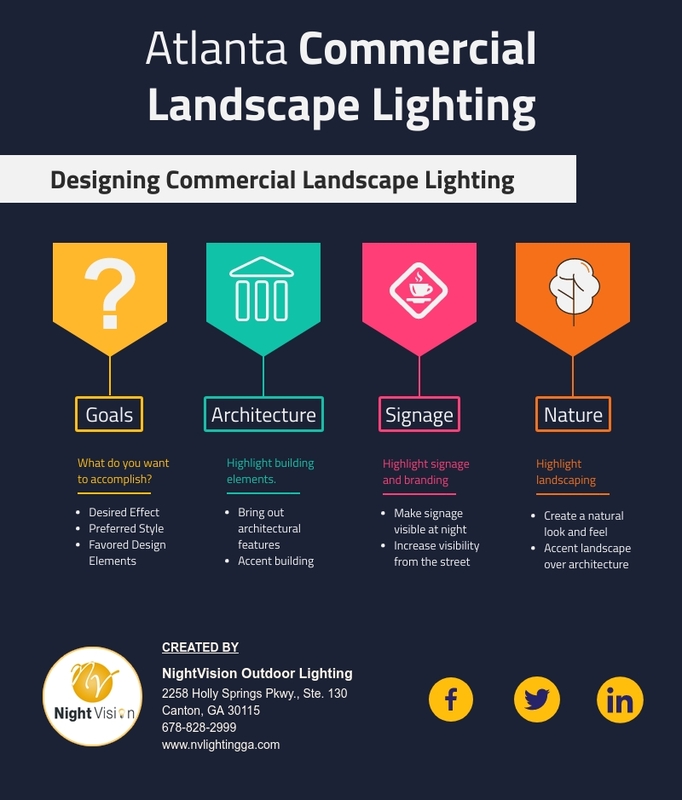 NightVision Outdoor Lighting offers free consultations on how to get the best, most economical commercial landscape lighting solutions possible. Ask a Professional: Do I Need Outdoor Residential Lighting?